I have mixed feelings when people exclaim “I can’t believe this is vegan!” when they taste the vegan baked goods from my kitchen. As much as I’m pleased that they enjoy the cookie/muffin/cake/brownie, I’m a little disappointed that the underlying assumption is vegan baked goods would not taste good. The most important lesson I learned when I ventured into the world of vegan baking is not about what you cannot use, but to expand my horizon beyond flour, butter, egg, and sugar in baking. There are many different ways to achieve tender crumb, moist texture, and deep flavour. 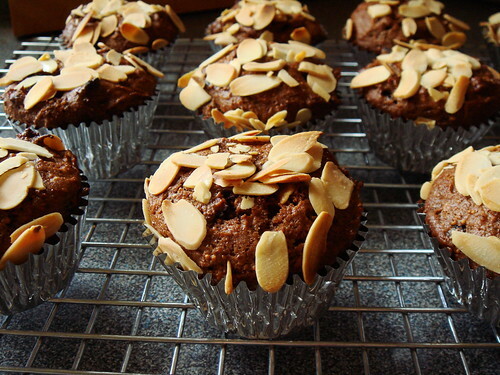 I was very intrigued when I read Dan Lepard’s recipe for Mocha Fig Muffin in his series on vegan baking. It’s common practice for quickbreads to make use of fruit puree for adding moisture and sweetness. Banana, zucchini, carrot, apple, and pumpkin immediately come to mind. Making a puree using dried figs and hot water is a first for me. I love the concentrated jammy sweetness of black mission figs. This puree is the backbone of the muffin providing plenty of moisture, body, and flavour. The other add-ins for this recipe are no slackers either when it comes to enriching the taste. Instant espresso and cocoa powder add the right touch of richness to temper the fruity sweetness. A blend of cinnamon, ginger, and cardamom adds warmth. The toasted almond slices are not only pretty look at but I also love their slight crunch. I added a big pinch of salt to the batter and that is the only change I made. I would love to experiment with whole wheat, buckwheat, or rye flour next time. I think the rustic nature of this recipe ought to be a good match. Besides, the combination of figs and buckwheat is one that I want to try again. I am also interest in making this recipe using coconut butter. The recipe called for corn oil and I used grapeseed oil this time. I think this is a reasonable substitution with little effect on the final result. I just bought a bottle of Artisana coconut butter last weekend on sale and I cannot wait to bake something with it. With two teaspoons of baking powder in the batter, these muffins rose to great height forming beautiful domes. This is the look I prefer for muffins and cupcakes. The dark burnished colour contrasting with the golden sliced almonds is so pretty to look it. I love all the tiny crunchy fig seeds against the moist crumb. This is a recipe I will return to again and again not because it’s vegan, but because it is quite simply delicious. 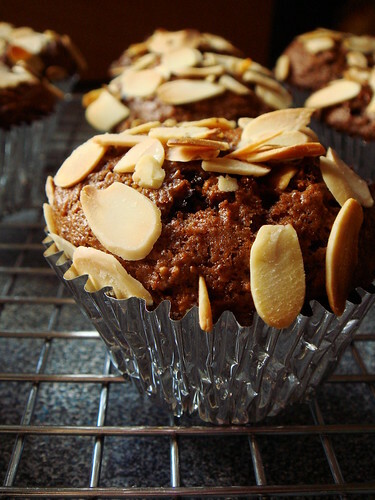 This muffin reminds me how much I enjoy vegan baking. I think it is time to play around in the kitchen some more!